China weakened its currency, the renminbi, for a second straight day on Wednesday, jolting markets across Asia and raising concerns about the path of the giant economy. The central bank, the People’s Bank of China, set the official rate for the renminbi’s exchange at 6.33 per dollar on Wednesday morning, or 1.6 percent lower than the previous day. It was the currency’s second-largest one day drop since 1994, when China’s modern foreign exchange system began. 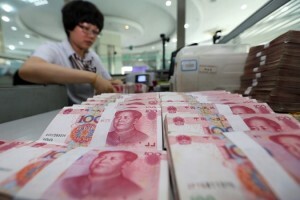 The largest drop was on Tuesday, when the renminbi was devalued nearly 2 percent. The move sent other Asian currencies lower for a second consecutive day on Wednesday. Stock markets also fell across the region. Hong Kong’s main index fell 2.4 percent while in Japan the Nikkei 225 stock average closed down 1.6 percent. The sell-off was steeper in Southeast Asia, where the main share index in Singapore fell 2.9 percent, while Indonesia’s Jakarta composite index closed 3.1 percent lower. The Euro Stoxx 50 index, a barometer of euro zone blue chips, was down 2.5 percent at midday, while the FTSE 100 index in London was down 1.3 percent by late morning. The euro rose almost 1 percent, to $1.11. China appears to have two main goals in allowing its closely managed currency to weaken. For one, it could help offset the country’s slowing economy. Exports have been particularly hard hit, contracting by 8 percent in July, and a cheaper renminbi makes China-made goods relatively more affordable for consumers in the United States and Europe. At the same time, China is also seeking a greater role for its currency on the global stage. In recent months, policy makers have been lobbying the International Monetary Fund to include the renminbi in its basket of global reserve currencies, which includes the dollar, euro, yen and pound. That means convincing the fund that the renminbi is a freely traded currency.